Our Extreme 4X4 Series is ideal for rock and mud crawling. This series is very similar to our Heavy Hauler, except it’s built with climbing and spinning in mind. It has slightly more aggressive shifts and more punch built in. It is ready to head to the mountains or play in the bog – your choice. The unit is disassembled and each part carefully inspected and clearances are measured to meet our specific specifications, not just the maximum clearance allowed by GM. The case is carefully inspected, cleaned and re-inspected. Then it is coated with a special heat and oil resistant paint, making for a very clean finish and look. Bushings are replaced and sized as needed to performance specifications. The intermediate clutch sprag consists of an extreme duty intermediate sprag and roller assembly with specially prepared race and spiral ring to prevent high RPM snap ring release and resulting intermediate clutch failure. The forward and direct clutch friction plates are replaced with heavy duty performance friction plates. The drums are then modified to accept additional friction plates. The apply area itself is altered to allow use of the entire piston area for apply in the forward drum. “Dished” cushion plates in these units are replaced with the TH400 style plates for additional reliability. These modifications will also result in a much firmer apply into gear from neutral/park to reverse/drive, and durability is significantly increased. For the intermediate, direct and overdrive clutches we use the Raybestos Stage 1 Performance friction plates. These friction plates exceed anything on the market for performance street/strip and heavy duty applications, and are more than suitable for any application. The intermediate overrun band is replaced with a heavy duty unit. This is extremely valuable in heavy duty truck applications, since this band is used to hold back when the transmission is manually put into 2nd gear while descending steep grades, etc. It will hold up significantly better to engine braking. The low sprag is replaced with a heavy duty type and the low/reverse band is replaced with either a performance band, or a heavy duty band for our extreme 4X4 applications. 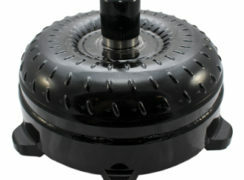 The Pump is carefully inspected and reconditioned for maximum durability and pressure. Special modifications are made to increase cooling and planetary lubrication. Each unit comes with a PerformaBuilt warranty according to the terms listed on our warranty page. Unlike our other units, 4L80E transmissions must be shipped by truck freight. While shipping is still included in the transmission price, you must have access to a loading dock and/or a forklift to receive this unit. This unit also features many other modifications for performance and durability, which help it achieve its +1000 RWHP capabilities. This transmission will take whatever you can dish out and we guarantee it! You won’t find a better unit anywhere. And, with our customer service and the staying power, that come with a large company, you can count on us to be there when you need us. The unit, as with all of our units, is warranted from the day you received it. Please visit our warranty page for more details and conditions. Please note our Warranty page. This transmission comes with a 1 Year Warranty. 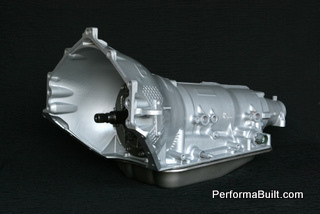 This transmission will support up to 1000 RWHP. All units are available in either 2wd or 4X4. If you have a special application requiring a special adapter or output shaft, please contact us and we will be happy to provide it and quote a price for your special application. 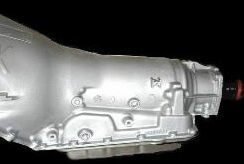 The LSX transmission has a removable bell housing which is not included with our transmission. You will need to use your original bell housing and extension housing, but the transmission will have the appropriate output shaft for your application.These items are available at additional cost. 1989 to 2008 4L80E transmissions. 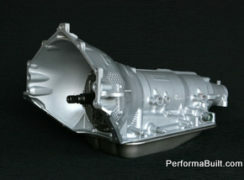 PerformaBuilt cannot supply OEM torque converters with 4L80E transmissions. If you have any questions feel free to call 1-888-744-6542, or email us at sales@performabuilt.com. We also have Live Chat during business hours; located in lower right corner of this webpage.